Scientists say we must keep global temperature rise under 1.5C - so what does that mean for the UK? Next week, ministers are likely to ask their advisers how Britain can reduce carbon emissions in line with that target. They’ve declared what they're calling Green GB Week – a celebration of the UK’s achievement as a world leader in tackling climate change whilst increasing the economy. But will they make the huge carbon cuts still needed on these six key issues? Overall, the UK’s CO2 emissions have been falling, but transport emissions have gone UP by 4%. People are buying bigger cars after the Treasury removed the fuel duty incentive for low-pollution hybrids. 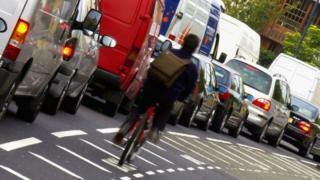 Drivers have also turned away from diesel vehicles, which create fewer greenhouse gases but emit more local pollution. The government’s advisory Committee on Climate Change says sales of electric cars and installation of charging points are both too slow. Meanwhile, campaigners say the decision to help people fly more often by expanding Heathrow shows ministers haven’t grasped the scale of the climate challenge. Our ageing housing stock leaks heat, and we can’t meet carbon emissions targets unless we insulate homes better. But home insulation has plunged by 95% because insulation grants have been cut. Labour pledges to create 160,000 jobs in making homes energy efficient - but the Treasury doesn’t want to pay householders to improve their homes. The government also scrapped a plan for zero-carbon homes – that’s homes which create as much energy as they use. Heat for industry is a huge issue too. Ministers have been criticised for glacial progress in promoting technology that can capture CO2 emissions from industrial heating. The government is pushing to exploit shale gas by the controversial technique of fracking. They say it’s good for jobs and balance of payments. Greens ask why we are seeking more gas when burning the fossil fuels we’ve already found would wreck the climate. Meanwhile, ministers want to expand nuclear power to keep a spread of options – even though wind power is far cheaper. The government has also virtually banned the cheapest potential source of energy – onshore wind. If food and plant matter is dumped in landfill, it will rot and create methane, which contributes to climate change. Many councils are now separating food and garden waste so firms can harness the methane as useful biogas. But after a good start, emissions have been rising. There’s confusion and inconsistency between local councils over the best ways to deal with waste. Farming is a major source of greenhouse gases. Fertilisers and manure emit greenhouse gases, and farm machines pollute, too. Emissions from farms have barely reduced. Scientists also say we need more woods and trees to soak up the CO2 we produce. They also want more energy crops grown to substitute for oil in powering vehicles. And they want us all to eat less meat – especially beef – because plant-based foods create fewer emissions. We’re going to need new technologies to help us use energy differently. Online systems can save individuals wasting energy, and enable us to buy power more cheaply. We also need to store much more of the electricity generated when the wind’s blowing strongly or the sun is bright. And we must strengthen local electricity networks to cope with the power created by local solar and wind energy. Attempts are also being made to harness hydrogen as a fuel source for trucks, buses and homes, but progress is very slow. It’s all a mighty challenge, made harder by the up-front cost of innovation. How green will Green UK week really be?